What I love about my work is the blend of right- and left-brained thinking. To achieve an inspiring experience for an audience — be it scenery that transforms before your eyes, an environment that sweeps you away, or just a perfectly timed light cue in a musical number — takes not just artistic vision but a great deal of technical skill, precision and planning. I enjoy nothing more than turning a lot of hard work into a bit of magic. Fake magic. Which is my favorite kind. I guess I got my start making movies with my dad’s video camera. My friends and I set up a studio in the basement, complete with curtains (bed sheets), props (laundry hamper as news desk), and lights (probably a code violation). By the fifth grade I was running the spotlight for school plays and never stopped doing technical theatre. While getting my degree in music education (CU Boulder) I worked at Macky Auditorium (the school’s road house) and the opera department’s scene shop. At those places I was lucky to have great mentors and to get an unofficial second major in production. After college I worked a mish-mash of carpenter, designer and technical director jobs until starting You Want What? Productions. Like most small business owners, at You Want What? I mostly just sit in my office sipping scotch and smoking giant cigars. Which is what I call working with clients, designing our products, and developing the business. Outside that, I also design scenery and lighting for many theater and dance companies. I’ve received Colorado Theatre Guild Henry Award nominations for Best Lighting Design (Boulder’s Dinner Theatre’s Ragtime) and Best Scenic Design (Vintage Theatre’s A Streetcar Named Desire). I've even had the opportunity to production manage the Off-Broadway premier of Dot by Coleman Domingo, directed by Susan Stroman at The Vineyard Theatre, and I spent 10 weeks in Beijing (after a year of planning) as Production Supervisor for a Chinese-produced, 50,000 square foot immersive Peter Pan. Ask me about that sometime (preferably over a drink). I have created my own job doing the work I love with colleagues and clients I respect. We should all be so lucky. p.s. 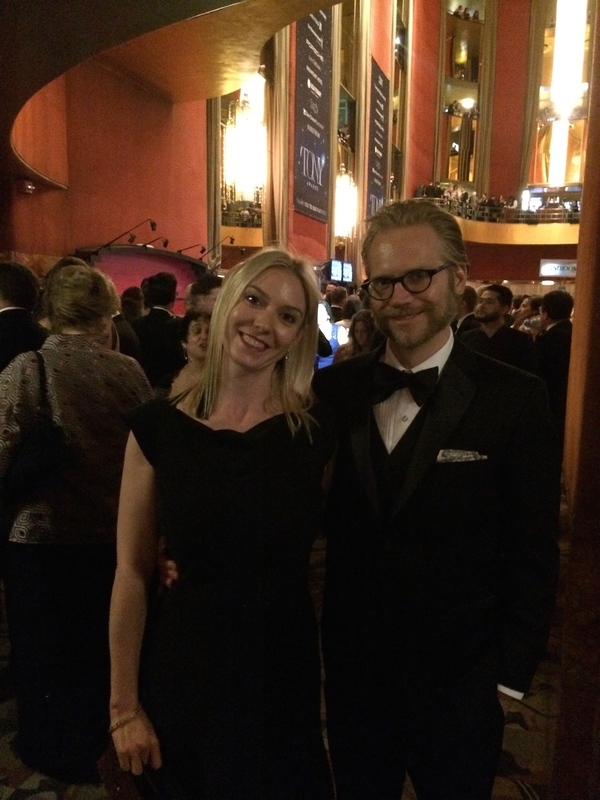 It was because of my wife, Emily's work that I got to attend the Tonys (pictured). Speaking of lucky. As shop foreman for You Want What? Productions I am responsible for the construction and fabrication of all scenic elements that are produced by the company, as well as the assurance of quality and workmanship of all employees. As a young adult I started my career on the east coast at the North Shore Music Theatre as the Master Carpenter. In the 20 years since, I have designed, constructed, fabricated, and created all kinds of things for a large variety of companies. For ten years I was proprietor of a Boston-area scenic fabrication company, completing hundreds of projects with budgets of a few thousand to upwards of $200K. Some of the larger projects include work for Fox Television, several themed bars and restaurants, Macy’s and Filene’s annual Christmas windows, and installations for the Boston Museum of Science and the Boston Children Museum. I have extensive experience in automation, museum display, and theatrical scenery. Before coming to You Want What? Productions in 2009 I put my knowledge to use working in the timber framing industry, exploring green construction technologies. I also served as the Technical Director for the Tony award-winning Williamstown Theatre Festival in Williamstown, MA. I have worked on thousands of projects but am still excited by the creativity and surprises each new day brings. If you call YWW for something scenic related I'll probably be the guy you get on the phone. As Accounts Associate my job is to work with prospective clients; together we will determine the needs of your specific project before I hit the ground running to crunch the numbers, cross the t’s, dot the i’s, buckle down, and go the extra mile to find as many idioms as possible. Along the way I will be the conduit of information between our clients and our shop to ensure the finished product matches all your specifications, desires, and expectations. So what qualifies me for such an important role in this process? I have been working professionally in the production industry since before I graduated from Emerson College in 2008 with a B.F.A. in Technical Direction. Before moving out to the beautiful mountains of Colorado in 2014 I worked with the Blue Man Group for almost 10 years. Those bald blue dudes taught me a lot about teamwork, work ethic, paint, cleaning, and drums (but don’t ask me to keep a beat for too long; remember I worked backstage). When I wasn’t cleaning up blue makeup I spent a fair amount of my free time working with a variety of theaters and companies in Boston and New York as a scenic carpenter, picking up valuable knowledge of construction and installation techniques. What I love most about my job is that I spend my days working with people to bring their dreams (or their client's dreams) to life. I think teamwork is the key to success, and by working together people can accomplish things greater than their wildest expectations. Give us a call, meet our team, and let us bring your imagination to life! My passion for building and creating unique things started with my first set of Lego. When I began high school I was dedicated to becoming an engineer. However, during my senior year I auditioned for the school play and, as they say, the rest is history. After high school I went on to the University of Northern Colorado to get a B.A. in Theatre Arts emphasizing in Design and Technology. During my four year stint there I worked on about 13 shows a year, both educational and with the professional summer stock, Little Theater of the Rockies. The experience I gained from my schooling and my mentors during this chapter in my life was priceless. The overall goal of going to college is to find your own niche – the career path that you love and will be profitable for your lifestyle. At You Want What? Productions I have found exactly that. I work on a new and unique project nearly every day. This environment leaves my imagination open to new ideas and continual learning. There is never a dull moment between working on scenery for shows, building interactive museum displays, or replicating a video game at full scale. At You Want What? Productions my duties are to create technical drafting, purchase necessary materials, manage the over-hire lists, create daily task lists, lead set install/strike, and finally I am the scapegoat for any rare but inevitable problems. I strive to create high quality professional work with the collaboration of our fantastic team. Now, what would you like us to build for you?